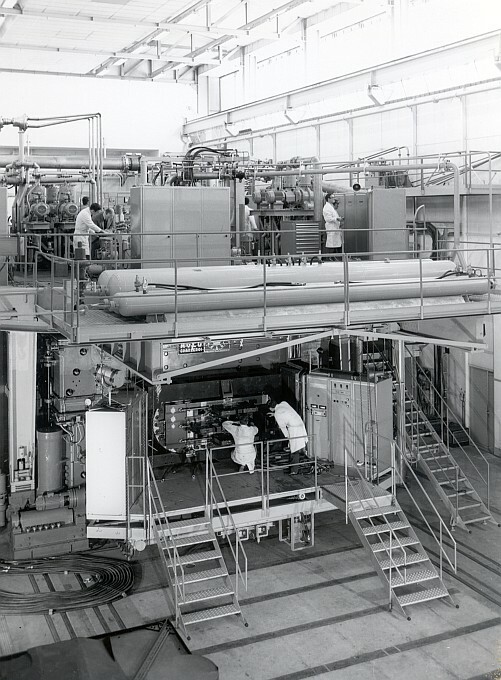 The bubble chamber, invented by Donald Glaser in 1952, consists of a tank of unstable (superheated) transparent liquid – for example, hydrogen or a mixture of neon and hydrogen at a temperature of about 30K. This liquid is very sensitive to the passage of charged particles, which initiate boiling as a result of the energy they deposit by ionizing the atoms as they force their way through the liquid. 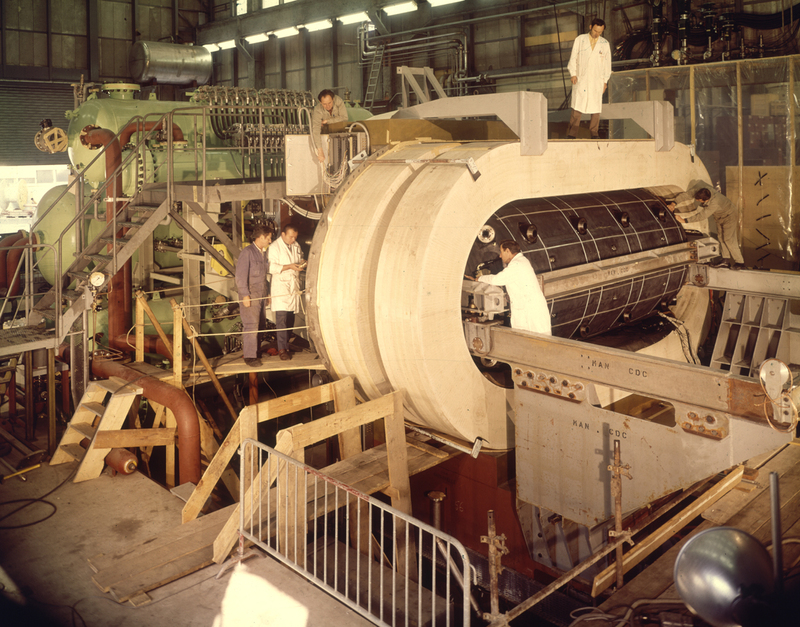 The liquid (these figures are for a roughly 2:1 neon-hydrogen mix) is prepared and held under a pressure of about 5 atmospheres (1atm=105 Pa). Just before the beam arrives from the accelerator, the pressure is reduced to about 2 atmospheres making the liquid superheated. As charged beam particles pass through the liquid they deposit energy by ionising atoms and this causes the liquid to boil along their paths. Some beam particles may also collide with an atomic nucleus – this is what we want to study - and the charged particle products of such interactions also ionise the liquid causing trails of bubbles to form. The bubbles formed are allowed to grow for a few ms, and when they have reached a diameter of about 1 mm, a flash photograph is taken (on several views so as to enable the interactions to be reconstructed in 3-dimensions). The pressure is then increased again to clear the bubbles and await the arrival of the next burst of beam particles. The time between bursts varied from about a second in some chambers to about a minute in others; so an experiment needing hundreds of thousands of interactions could take many months.